Mangaluru, June 15, 2015: An IT professional in Mangaluru was allegedly harassed and threatened by a bunch of Taxi drivers for using Ola Cab. On June 10, the woman had been to Bengaluru for some work, and came back to Mangaluru on June 12 on Jet Airways flight after she got news of her father-in-law’s critical condition. She landed to Mangaluru on 4 pm. As her father-in-law was critical, her husband had booked an Ola cab online so that she can reach home early, but as she walked out of airport and headed towards the waiting Ola cab, she was horrified to see the Ola cab driver getting manhandled by the taxi drivers. The Taxi drivers snatched away the key of the cab, the Ola driver was begging them to return it. The taxi drivers assaulted the Ola cab driver to run away and not to pick any passengers from the airport in the future, She also said that the taxi drivers allegedly abused her, threatened and stopped her from getting into the Ola cab. She further states in the complaint that she ran from the group of Hooligan Taxi drivers in an obstreperous condition who almost chased her for two kilometers. 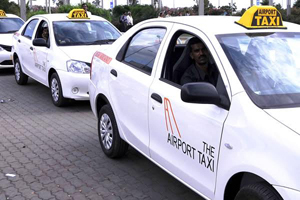 “While coming out of the airport, they said they would kill me if I use Ola cab again they also said that the Mangaluru police and the Airport authorities are under their control and they are doing this with their assent" she said. She censured that none of the Airport authorities came for her help though the incident took place in front of Airport security. Finally, she reached home but her nightmare became reality when she learnt that her father-in-law had passed away minutes before she reached home. "The whole incident has affected her emotional health and behavior she said. She wanted to lodge the complaint immediately,, but could not as her father-in-law’s funeral was held on Saturday Jue13. An FIR has been lodged at women’s police station. In her complaint she pleaded the police to conduct an inquiry against the airport authority and take stringent action against the hooligan taxi drivers. It is shocking that just a couple of days ago, Mangaluru airport was rated second best in the county, but such incidents make us wonder whether airport really deserves the second position.